Will Portugal win against the blue team? Is it possible to predict with great certainty who will be crowned Europe’s best football* team this summer? No, but we are flooded with a barrage of statistics which try anyway, e.g. ‘Spain won the last competitions at European and World levels but no one ever went on to win the following European Championship after such a run, therefore Spain won’t win’. Because I neither like unreliable statistics nor understand all that much about football it is time to turn to Psychology and see what team it would put its bet on. 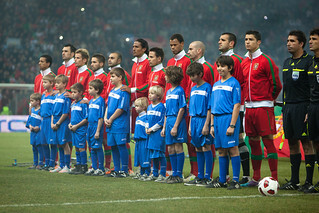 That team is Portugal, or indeed any other team with red jerseys. In order to substantiate this claim one needs an intuitive theory and some well controlled experiments which support it. The theory is simply: red signals danger. This is seen both in our evolutionary past (e.g., our skin turns red when angry) and in our cultural past (e.g., red traffic lights). But football is different because the colours have no signalling quality other than to indicate team membership. Portuguese players are not constantly angry. Still, that doesn’t stop the danger signal from influencing behaviour as shown in a recently published set of experiments. Similar to football, poker chips just happen to be red sometimes. Femke Ten Velden and colleagues from Amsterdam looked at online poker strategies (article in press at Journal of Experimental Social Psychology). In a two player game, when holding the card 8 one has about an equal chance of winning and losing. In this experiment the (computer) opponent started the game by placing a bet. How would the participants react? Would they play aggressively and raise or instead fold because they predict a loss as well as little chance to bluff themselves out of it? When the opposing player happens to use red chips participants folded 63% of the time. When the opponent’s chip colour was white or blue, however, they folded only 18% and 24% of the time respectively. 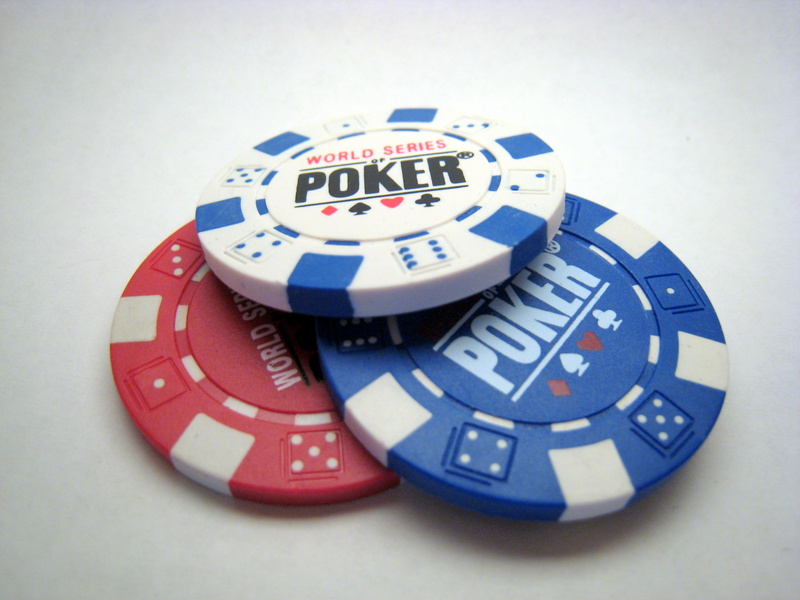 Perceived intimidation by the opponent mediated the effect of chip colour on Poker strategy – as if red chips make an opponent look more dangerous. Does the effect also work the other way around? What happens when the participants themselves have red chips rather than white ones? In a follow-up experiment the participants started the game and indicated through the amount of the initial bet how aggressively they wanted to play. Furthermore, they indicated their feelings of dominance. Turns out that the red=intimidation effect does indeed also work the other way around: players who hold red chips place bigger bets than players holding white chips. This effect was mediated by subjective feelings of dominance. So, playing against red is intimidating while playing in red increases competitiveness. So far, we have all the ingredients for a betting strategy for Euro 2012 based on Psychological findings: the theory predicts an effect whether you are on the nature side (evolution) or on the nurture side (culture) and that effect is seen in the lab under well controlled conditions. Time to turn to real life sports and see how these effects play out there. Greco-Roman style. Winner on top. Hill and Barton looked at combat sports during the 2004 Olympic Games and found competitors with red attire to win 55% of the time, those with blue attire 45% of the time. 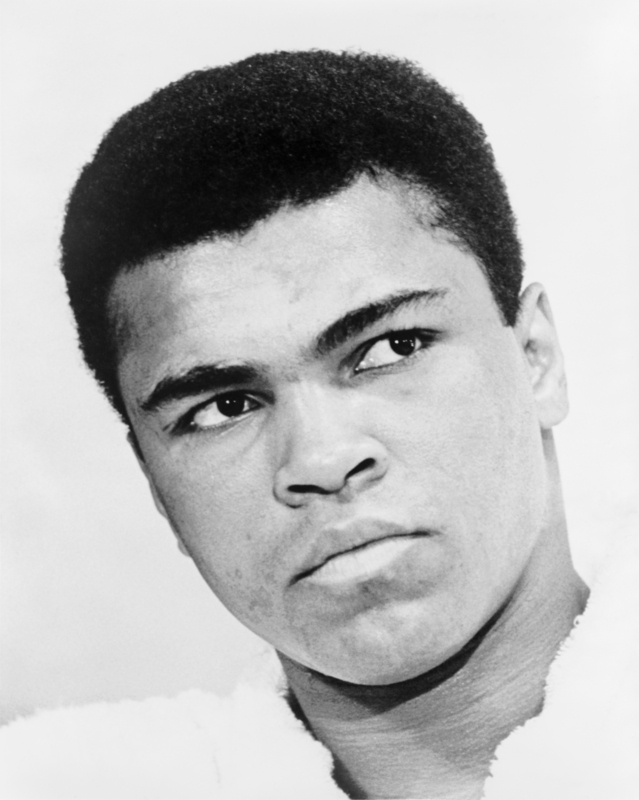 The effect was found in all the combat sports they looked at: boxing, tae kwon do, Greco-Roman wrestling and freestyle wrestling. Finally, even in football the effect could be shown. During Euro 2004 five teams played some games in red shirts and other games in white or blue shirts. Wearing red increased the number of goals. Three years later the same research team (Attrill et al., 2008) looked at a bigger data set: 55 years of English football. The likelihood of winning the championship was greater than chance for red-wearing teams only. Furthermore, if they played at home – and thus actually wore their red shirts – these teams tended to score more points per game and won more often. On top of that, when looking at major cities with more than one football club, the one in red tends to have a better average league position over the long time period since WWII. Thus, the red=intimidation effect appears to work in competitive sports as well. Psychology makes a clear recommendation: put your money on a red team. Because evidence from inside and outside the lab as well as nature/nurture reasoning support red teams. So what? Red teams tend to have a bigger chance of winning but Germany (white/black) is still the team with the most Euro wins ever. Well, this post is not about Portugal’s guarantee to win, it is about their chances. Of course football is not a fashion show where what you wear counts more than what you do. But it is not exactly colour-blind either. Portugal has an advantage. Will they use it? *I mean what Americans sometimes call soccer. What’s the point in name change? – Life change? This may be a completely obvious statement if it wasn’t for what it entails. First of all, words have to be pronounced. Secondly, words carry meaning. Both properties change how words are used. A bunch of studies has recently shown that these properties also influence how the people behind names are perceived. In essence, names open up the door for biases, misperceptions and prejudices. Be careful, if your name happens to be Mohammed Vougiouklakis you may not like what you’re about to read. Firstly, pronunciation is important. If a word is unpronounceable, it never enters a community’s language. Turns out people whose names are unpronounceable also have trouble in the community. Laham and colleagues (2012) asked Australian undergraduates to rate how good a fictional local council candidate was. Participants read a fake local news article which was always the same except for the surname of the candidate which was either difficult to pronounce (Vougiouklakis, Leszczynska) or easy (Lazaridis, Paradowska). Easy to pronounce candidates were rated better. In another experiment, Laham and colleagues looked at the hierarchy within real US American law firms. Pronounceability was associated with the lawyer’s position in the firm’s hierarchy. This was found even just for the subset of names which were Anglo-American, likewise for the foreign name sample. So, the more easily pronounceable the name, the better your career prospects. It is worth appreciating how weird this outcome is. People did not rate names but instead the people who carry the names. Furthermore, they had a wealth of information about them and one may think that name pronunciation is a very unimportant bit of information that is simply ignored. Nonetheless, even though it should be completely irrelevant for success name pronunciation appears to shape people’s lives. Secondly, words have meaning. The most important meaning of a name is what it says about the community you are from. It signifies gender, ethnicity, race, region, etc. One widely known American study is Bertrand and Mullainathan’s (2004) job application study in which real job adverts were answered with fake resumes only differing in terms of name. Black sounding names (Lakisha Washington) received less call-backs than white sounding names (Emily Walsh). Furthermore, application quality was not important for black sounding names while it did change call-back rates for white sounding names. 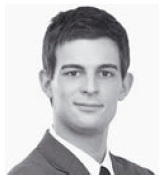 If he is called Tobias (rather than Fatih) he gets 14% more call-backs on applications. This is really just evidence for old fashioned discrimination in the job market. But it says more than that. In the American study, getting additional qualifications is worth it for whites while it did not have a significant impact on call-back rates for blacks. Thus, similarly to the pronunciation effect above, additional information does not reduce the effect of the obviously irrelevant name characteristics. Instead, in the case of Bertrand and Mullainathan’s study, additional information of application quality even exacerbated the race difference. The take-home message is that people take in all sorts of objectively irrelevant information – like names – and use it to make their choices. These choices are more likely to go against you if your name is difficult to pronounce or foreign sounding. People make choices about names and these choices affect the people behind the names. So, what is there to do? If you really want to treat people fairly, i.e. give people an equal chance independent of the names they were given or have chosen, give them a number. Because – and this will sound terribly obvious – numbers aren’t words. Cediey, E., & Foroni, F. (2008). Discrimination in Access to Employment on Grounds of Foreign Origin in France. ILO International Migration Paper 85E, International Labour Organization, Geneva, Switzerland. Kaas, L., & Manger, C. (2011). Ethnic Discrimination in Germany’s Labour Market: A Field Experiment. German Economic Review 13(1): 1–20. Wood, M., Hales, J., Purdon, S., Sejersen, T., & Hayllar, O. (2009). A Test for Racial Discrimination in Recruitment Practice in British Cities. Department for Work and Pensions Research Report No. 607. 2) as found in Kaas, L., & Manger, C. (2011). Ethnic Discrimination in Germany’s Labour Market: A Field Experiment. German Economic Review 13(1): 1–20. Computer Gaming = Mental Training? Computer gaming often gets a bad press. It gets linked to brutal murders (school shootings in Columbine, US and Winnenden, Germany , the massacre on Utoya and in Oslo, Norway ), gang culture, physical decline and death, brain degeneration, and low productivity. Susan Greenfield, a neurophysiologist and something of a celebrity scientist in the UK, links them to aggression, recklessness, and a decline in prosocial behaviour. However, there is also a growing literature on cognitive benefits resulting from the mental training provided by ordinary computer games. How good is the evidence for these positive side effects of being hooked on a video game? The start of the ‘computer gaming=mental training’ argument can be traced back to an article published in Nature in 2003. In it, Green and Bavelier claimed to have found evidence for bigger and better attentional resources in video game players compared to non-players. For example, in one task participants were asked to count squares briefly flashed on a screen. There are two ways to solve this task: subitizing, i.e. immediately ‘seeing’ the right number as after having rolled a die, and counting. Video game players could subitize more items than non-players. However, some may argue that perhaps only people with better attention get drawn to computer games in the first place. Green and Bavelier (2003) addressed this issue by training people for one hour a day over ten days on either Medal of Honor – an action game – or Tetris – a control game. Only the action game trained participants’ visual attention improved. The conclusion appears clear: forget about tedious, commercial brain trainers, play action games to boost your attention abilities. However, has the effect stood the test of time? Last year Boot and colleagues reviewed the literature and reported that researchers found out that gamers are superior to non-gamers in terms of various mental faculties: mental rotation, visual acuity, decision making, etc. Studies finding a relation greatly outnumber those which don’t. Furthermore, training studies are rarer but generally also find positive associations between action game ‘training’ and many of the aforementioned cognitive abilities. It looks like it is time to write a letter to all the fear mongers who link action video gaming to all sorts of social problems … not so fast. Would you notice the difference to a mental trainer? Has the effect stood the test of science? Even though the aforementioned studies were published in reputable scientific journals and apparently stood the test of time Boot and colleagues (2011) are critical of the claims of the ‘computer gaming=mental training’ field. For starters, most studies compare gamers to non-gamers and with this approach you never know what caused what (e.g., people get trained by computer games, or superior people get drawn to computer games) or whether giving people the feeling of being an expert already enhances their performance. The latter criticism also applies to training studies. In clinical trials of new medications, participants are not aware what condition they are in – whether they receive the real pill or the sugar pill. In game training studies, on the other hand, participants always know the game they are playing, obviously. Why would this be a problem? 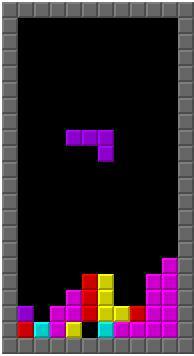 Tetris involves mental rotation but does not involve attentional demands. Medal of Honor in many ways is the reverse. If you were a participant and told to predict which training would benefit attentional abilities, what would you say? Just the expectation of improvement may drive the observed changes, i.e. a placebo effect. In sum, there currently isn’t very convincing evidence for the ‘computer gaming=mental training’ account. Still, the accumulated evidence is at least suggestive of real cognitive improvements. So, instead of looking in fear at brain washed gaming geeks on the verge of violent outbursts, we should perhaps envy them for their superior mental abilities. One moment. There is still the issue of those negative side effects. There, it turns out that a recent review by Hall and colleagues (2011) found the literature to be split between studies claiming a gaming-aggression link and those that do not. Even meta-analyses on this issue do not agree with each other. Furthermore, there are also substantial methodological issues in this field (Adachi and Willoughby, 2011). My message to gamers: game on.